We teach how to attract talented employees and motivate them to contribute. Then, identify leaders and allow them to impact the organization with their knowledge, expertise and leadership. 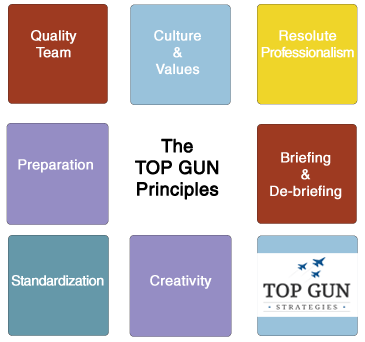 Top Gun Strategies assists businesses and organizations adopt the same goals that have made the Top Gun School so successful. Their principles, when applied properly to management and sales teams, have proven to be a powerful set of tools and have yielded impressive results in leadership development. Every organization is rich with talent and untapped value. Identifying the most potent and valuable of these riches is a challenge of leadership. Where are your future leaders? This is where these principles add value.